DSO Shell comes with full enclosure. The front panel and top/bottom brackets are flexiable for easy user modification. Rotary encoder has been added. It makes parameter adjustment much quicker and easier. The sensitivity of DSO Shell has been extended in both directions and is higher and wider than DSO138. It reaches 5mV/div --- 20V/div while DSO138 is only 10mV/div --- 5V/div. DSO Shell kits are provided in two configurations, 15001K and 15002K. The difference between them is mainly on the analog board. 15001K has all SMD parts on the analog board pre-soldered and leaves through-hole parts for user to install. 15002K has no parts pre-soldered. All components (including SMD's) on the analog board are to be installed by user. 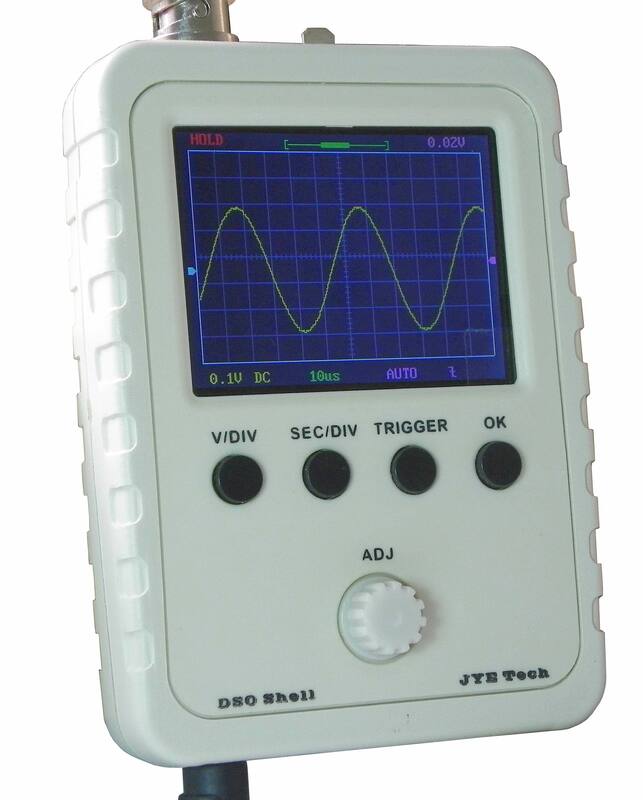 DSO Shell runs on 9V (do not use power voltage higher than 10V!) power supply. Users need to prepare their own power supply since it is not included in the kits. The power jack on the mainboard accepts standare 5.5mm/2.1mm DC plug. Alternative 2-pin connector (0.1" pitch) is also provided for convenience to connect to different power sources.